This is one of my favourite Spanish recipes. The Spanish Omelette (which is an omelette with potato) is such a traditional dish, many eat a slice on top of tomato bread or in a baguette and I can't recommend this enough!! Growing up in Spain, I have always been surrounded with delicious wholesome food. The secret is high quality produce and just a few ingredients in each dish. 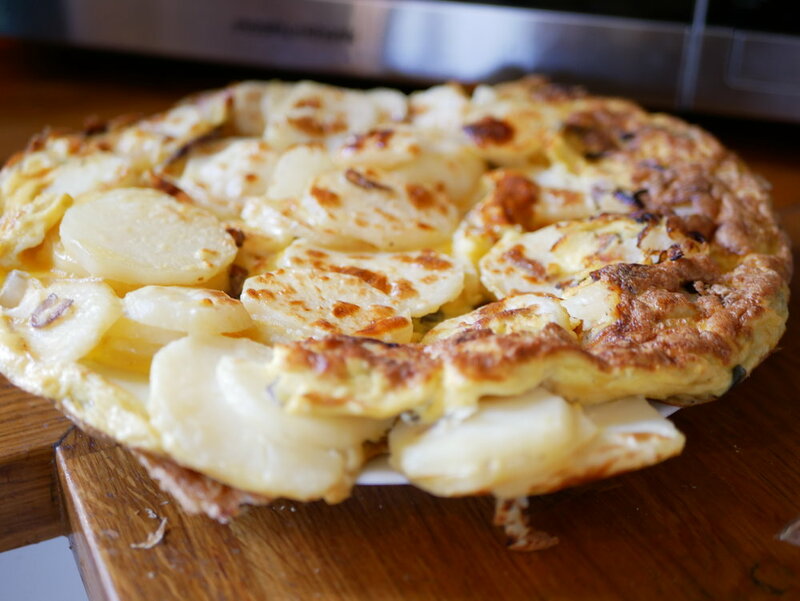 This Tortilla Española is a combination of potato, eggs and onion - that's it! But oh my goodness is it mouthwateringly good and so so so easy to make. Peel & slice the potatoes - I usually slice mine to just under 1cm but it really doesn't have to be exact. Par boil the potatoes in a large saucepan, take them off the heat once the water is boiling and drain. You don't want them to be soft as they will cook and soften in the frying pan. Slice the red onion and pop in a large frying pan with a dash of olive oil, fry on low until well cooked. Add the potato and gently mix together - try not to break or mash the potato slices!! Once the potatoes have browned a little, add the 9 well beaten eggs on top and pat down. With a rubber spatula go around the edge of the frying pan and move the mixture inwards slightly. Cook for around 15 mins. You can always pop it under the grill if you're having a hard time to cook it right through or can't flip it to brown the top.